"Dear friends, today live at Rockpalast: The Icebreakers!" With these words, Albrecht Metzger announced the blues band of four, which the audience of the Westfalenhalle 2 in Dortmund, Germany didn't know much about, yet on November 26th 1980. That's why the welcome was a little lukewarm at first, but about ten minutes later plaudits were rising: After the opener "Sweet Home Chicago" and "She´s So Fine", the "Master Of The Telecaster" entered the stage. 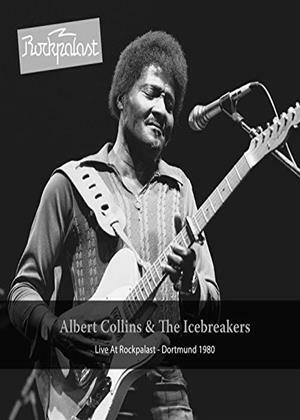 Albert Collins was immediately attracting his fans' attention: "Listen Here". Seconds after the extraordinary instrumental intro the ice melted away: An impish grin in his sweaty face the Texan in his red outfit drew his unique blue notes from his Fender guitar. Also "Cold Cold Feeling" was an expression of Collin's talent. With his long thin fingers and without the commonly used pick, the Iceman treats the six strings of his instrument in an inimitable manner. Also unusual was, that Albert Collins didn't wear his guitar belt along with his back, but solely around his right shoulder. This gave him more freedom to move, which he made use of, extensively. In addition to that, the very long cable gave him the possibility to go for a stroll into the audience - Collins wasn't yet using a wireless system. At this Rockpalast concert, he also left the stage to meet his fans in the crowd. Long improvisations and solos - also by his great band around saxophonist and singer A.C. Reed - are emphasizing his reputation as an experienced soloist and brilliant entertainer, evenhandedly.